A dessert that rivals any cheesecake that could be found on the Cheesecake Factory menu...Reese's Peanut Butter Chocolate Cheesecake! Because let's be honest, peanut butter is delicious. Hello Redfly Creations readers! I'm Monica and I blog with my friend Caroline on Pass the Cocoa. We're both college sophomores, and in our free time we love baking sweet (and occasionally savory) treats to share with friends, family, and everyone who loves food. 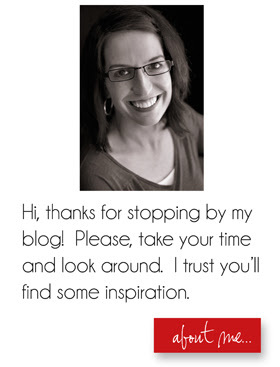 We are positively thrilled to be guest posting for Melissa. Her blog is one of my favorites not only for its delicious recipes -- for example, The Amazing Amish Cinnamon Bread, which I made! 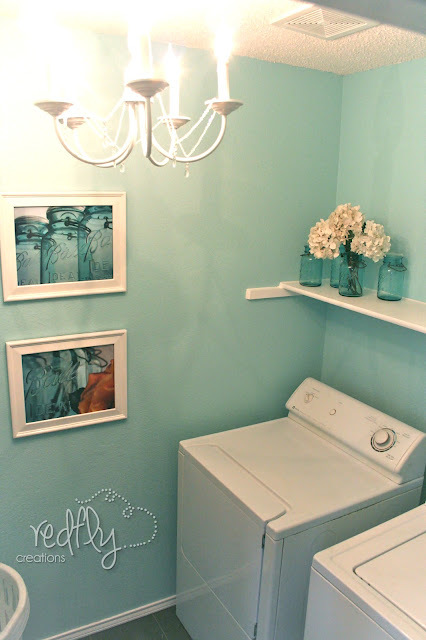 -- but also for having such wonderfully creative and practical DIY ideas. 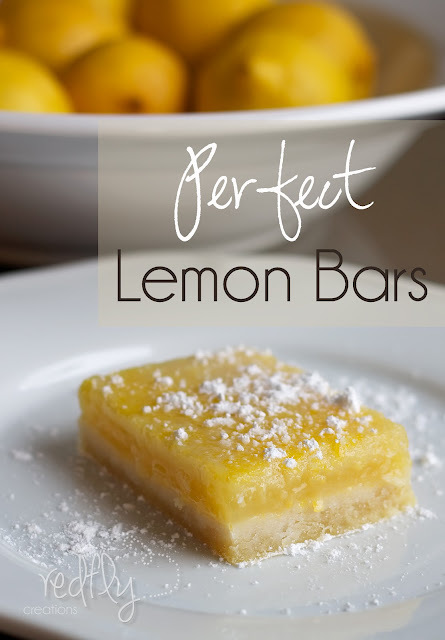 Naturally, I wanted this recipe to reflect the DIY theme of Melissa's blog, so here you have it. Beat the room-temperature cream cheese just until it first becomes smooth. It's important not to overbeat, or else additional air will be beaten into the mixture, and the cheesecake will not have the right texture. Allow me to cut a slice for you. Bon apetit! 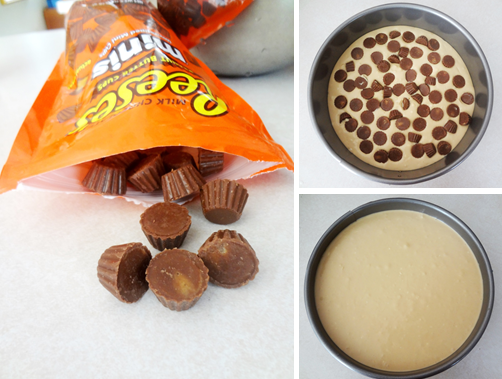 Click here for the printable recipe of Reese's Peanut Butter Chocolate Cheesecake. Chunks of Reese's peanut butter cups in the creamy peanut butter cheesecake with a thick layer of delicious dark chocolate ganache and peanut butter drizzle on top. 1. Preheat oven to 350 degrees F. Grease 9-inch springform pan. 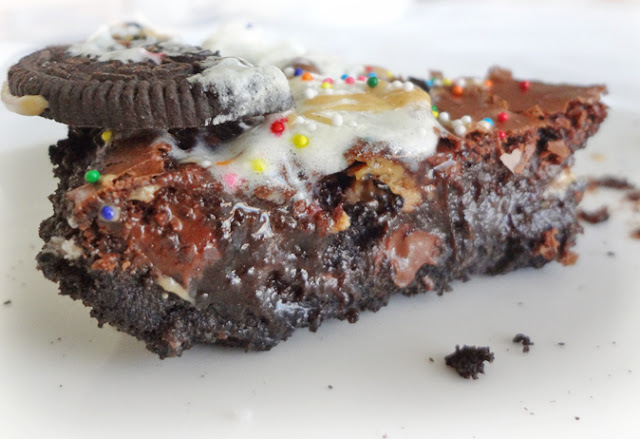 Finely crush Oreos and melted butter in a food processor until well-blended. Press crumbs evenly onto the bottom (not sides) of prepared pan. Bake just until set, about 5 minutes. Cool while preparing the filling. Maintain oven temperature. 2. Take your room-temperature cream cheese and beat just until it becomes smooth, and then stop. Do not overbeat. Add eggs one at a time, beating until just incorporated but not more. 3. Add brown sugar, peanut butter, and heavy cream. Beat until just smooth, then add vanilla. Mix for a couple strokes, then stop. 4. Pour half of the cheesecake mixture into the springform pan. Layer with 2 cups of the mini peanut butter cups, then top off with the remaining cheesecake mixture. 5. Turn the oven down to 325 degrees F. Bake for 1.5 hours. Do not open the oven door at any point during the baking process, or else huge cracks will form on the cheesecake surface. To tell if the cheesecake is finished, wiggle it a bit. The sides should be firm, but the middle may be slightly jiggly. Do not use a toothpick to test for done-ness, because it doesn’t really work. 6. Cover the cheesecake springform pan with foil and refrigerate overnight, or at least 4 hours if you’re in a rush. 7. Heat 3/4 cup heavy whipping cream and 6 ounces semi-sweet chocolate in a medium saucepan over low heat, stirring constantly until smooth. Cool slightly before pouring over the center of the cheesecake (while still in springform pan). 8. Place about 20 mini peanut butter cups along the perimeter of the cheesecake. Cover the cheesecake with foil and chill for another 30 – 60 minutes until the chocolate is set (not wet to the touch). 9. 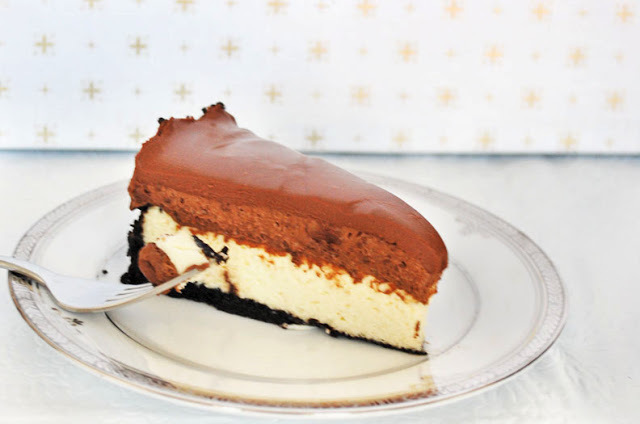 Once the chocolate is set, take the cheesecake out of the refrigerator. Microwave peanut butter and 1 tablespoon heavy whipping cream in 10-second intervals until you achieve a runny consistency, stirring between each interval (should take less than 1 minute). 10. 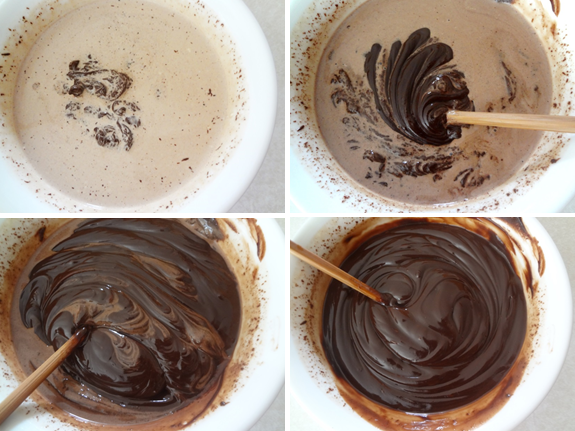 Place in a piping bag (or place inside a plastic bag with the corner tip cut off), and pipe a swirl onto top of the chocolate ganache. Serve and enjoy! Hungry for similar recipes? Try these! Thank you so much ladies for sharing this wonderful dessert with us. I can't wait to try it out! This looks amazing! Pinning! I would love for you to share and link up at my weekly TGIF Link Party if you haven't already this week. Your favorite posts, most popular, recent or new! The party is open every Thursday night and closes Wednesday's at midnight. Followed by (Not SO) Wordless Wednesday! http://apeekintomyparadise.blogspot.com/. This looks amazing. My husband's birthday is next week. I think I have to make this for him! Boy this sounds delicious, but it sooo unhealthy for you. Oh My! My mouth is watering! Looks Delicious! This Reese's Peanut butter chocolate cheesecake is one of my favourite recipes. 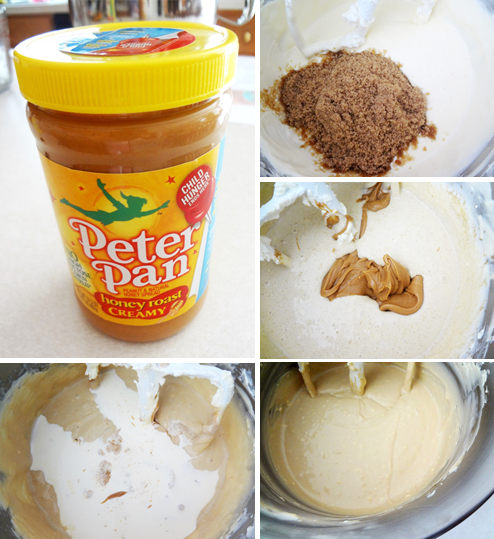 Peanut Butter filling is so good and helps to loose weight. 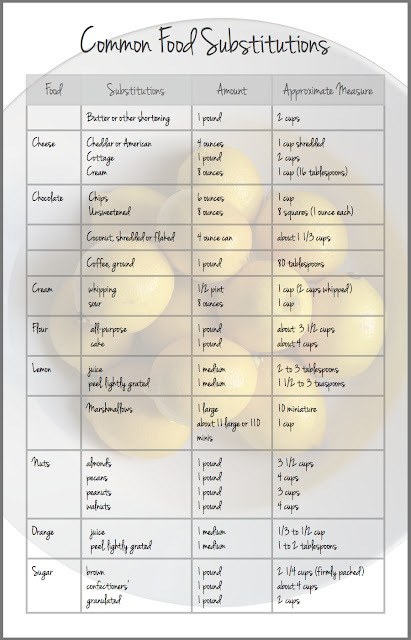 Making this for the upcoming holiday.